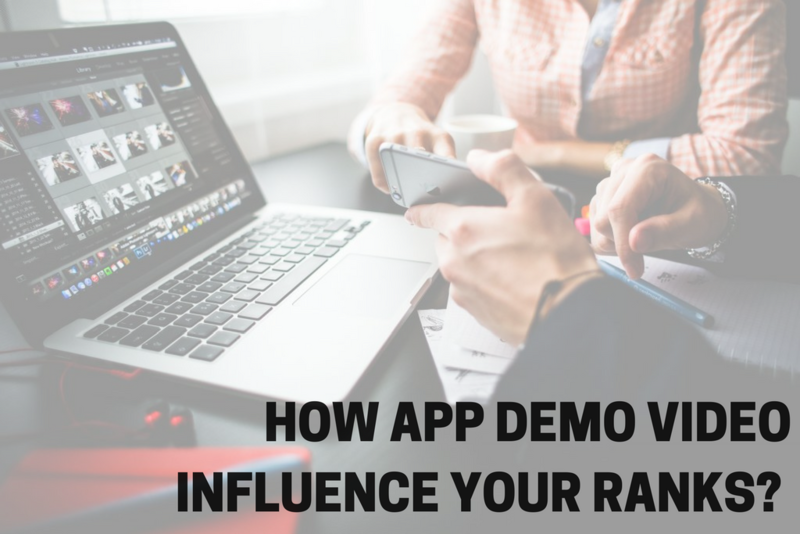 Why App Demo Video is so important for you App’s ranking? No secrets. If you want people to download your application – the visibility of it is a NEED. The right done App Demo video can bring you a lot of marketing benefits such as to improve your App’s visibility, user engagement and the download in the long run. Nowadays, people are more and more time conscious that they prefer being shown what your app is all about in a minute than to read through your press release or website content. With a demo video, it is possible for you to showcase and explain your app in a very short time, instead of having people to look at static screenshots or read about your app. You will also have the opportunity of doing it in your own way, giving room for laying emphasis on what you want. Create or get somebody to create a lively and exciting app video, keep it under one minute and ensure that you get your point across to your target audience. Avoid showing every little feature of your app because people may not likely remember them. Apart from the fact that your application should be easy to use, watching it in use also makes users to get a better idea of the way to navigate it efficiently and understand it better. The fact is that competition on the mobile app store is becoming tougher on daily basis and some of the available apps are not worth downloading. A video that is well done will reveal your seriousness and offer you and your app extra credibility that might eventually lead to a download. This is also true when you are asking a journalist or blogger for an app review. Another reason why app demo video is important is that it makes people remember your app. This is because you can show your screenshots, app icon or video captures of your application and real-life usage of it in a place that viewers can see the interactions they will have with the app. Using special effects, great visuals and voice over, you or/and music can create an emotional connection and also explain your app in a better way that will make people get excited about it. This will help them remember it, even if they don’t download it immediately. It is no more news that YouTube is the number two search engine. A great way to be found for certain keywords is to have a video that you can put on many platforms such as Vimeo, YouTube, and Dailymotion among others. On the other hand, search engines now provide value to video content, and when it comes to rankings, videos really show up high. App demo video allows people to share the interesting video they come across than an article, particularly if it is rightly done and thrilling. It is also a great way for online newspapers or blogs to add value to their posts and reveal to readers what your app is all about. These videos can be embedded easily and can end up on a number of websites from their owners effortlessly and without fear of duplicate content. It’s not a secret, that if you want people to download your application – the visibility of it is a NEED. An app demo video is an essential tool that will perform this function, provided that it is rightly done. Therefore, if you don’t have the skill of doing it perfectly, engage the services of a professional. Veedeem.com provides you with the professional app demo video services.